What's he wearing? : Good design at Busaba Eathai or just plain annoying? Good design at Busaba Eathai or just plain annoying? Yes we are still on the weekend edition of "00O00h!" and I am still musing about designs and inspiration for my new flat. I've pretty much decided I wanted to go for clean lines, simple classic shapes with no gimmicks. We had dinner yesterday at Busaba Eathai Covent Garden, and upon entering I commented to Disneyrollergirl that I really like the interior of their restaurant: the dark wooden interior, Buddha statues and the smell of incense burning at the reception. All very zen-like which I really love. 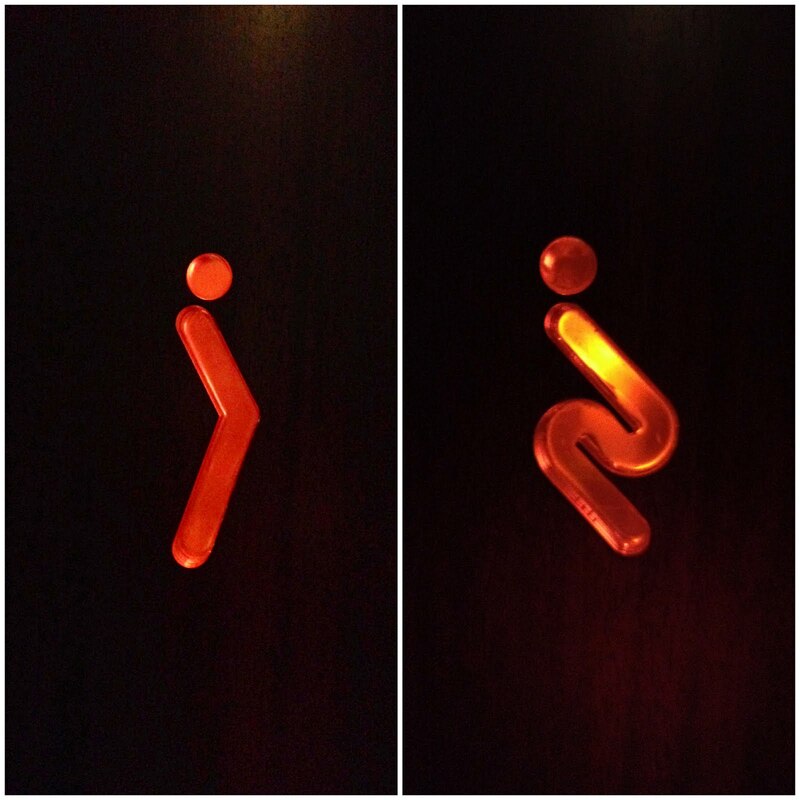 However I felt they really ruined it with the above designs etched outside their rest rooms. Perhaps with a touch of humour but I don't think it went well with the overall feel. I actually headed back up to ask the waiter which room was for the gents. It made me paranoid that some poor lass was going to barge in on me when I was at the urinals. And a little boy was outside, probably bursting at his seams, not knowing which room to use too. So I went from being embarrassed to angry really. So what do you think? And if you must know, the one on the left is for the gents and the right is for the ladies. I have no idea why. Do I lack serious creativity then? Ha they had those at my workplace. I like them, maybe not at a nice restaurant. wtf I would be pissed (no pun intended) too. I agree they're in bad taste, but those are supposed to be a man and a woman using the toilet. He's standing; she's squatting. Well if you look closely, the two designs reflect the way to differentiate the position of how men and women, you know, take a piss. The man is standing with his "tool" aiming toward the urinal, and the woman is sitting on the toilet. I got it right away, but I never like when they make it difficult to figure out which is which. The left one is a guy at a urinal. the left one is of a guy standing up and the right is of a girl siting down. it even sort of looks like how guys push their pelvises slightly forward when they urinate. Everything else, from lighting to carpentry joints to crockery had been so intensely considered that these signs always seem to strike a wrong note. I like the idea of an icon, but think it could be something a little cleaner and less joke-y? Yawwwwwn, enough about interiors, just give us the FASHION darling! Joking. I know which is which but I still have to double check every time, just to make sure. Which is obviously totally ridic. They make it more difficult to understand. lol u do lack creativity ! i had a good laugh when i saw those 2 signs.. pretty obvious and direct, ain't it!!? not that obvious when you are bursting for a wee!